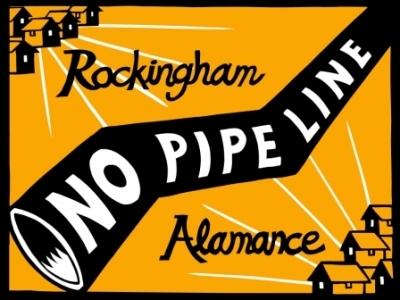 In April, Mountain Valley Pipeline announced a proposal to build a pipeline extension  that would run through Rockingham and Alamance counties in the Dan and Haw River watersheds. This 24-inch diameter pipeline would cut a 100-foot swath through private lands during construction. Contractors associated with this company have misled landowners and trespassed, and developers have painted a rosy picture to local officials and community members, while the same company has received over 150 violations and complaints along the current project in Virginia and West Virginia. 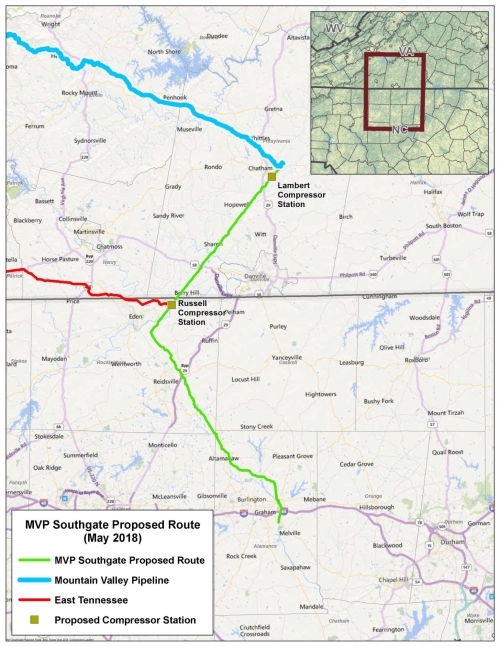 The project, “MVP Southgate,”  is an unnecessary pipeline in North Carolina, and would devastate the natural resources and put communities at risk. MVP Southgate would cut through headwater streams in the Haw watershed, clearing and grading land along the buffers to allow access to the floodplain, then damming up the streams. In this region, recreational access to rivers, streams, and parks drives tourism and many sectors of the economy. Many streams this proposed route plans to cross are impaired and the pipeline could be a long term cost for the county through mitigating nutrient management and stream buffers long after the pipeline is complete. In the rocky creek beds of the Piedmont, constructing these pipes would require coating drills with volatile chemicals and laying explosives in the creek beds to lay pipe three feet underground. This can cause silt, sand, and rock particles to shake loose into bedrock fractures that carry water into nearby bedrock wells. The Mountain Valley Pipeline’s proposed route through North Carolina. The volume of water released when dams are removed would devastate aquatic habitats. Sediment from the construction could travel into water supplies, carrying harmful contaminants such as volatile organic compounds that do not break down in water and cannot be removed in drinking water treatment. Many are known carcinogens. Nearly one million public drinking water users could be affected downstream. Many residents in Rockingham and Alamance counties rely on groundwater wells for clean and safe drinking water, but testing for these chemicals is costly and paid for by the individual landowner. MVP has a legacy of misleading community members and landowners by providing minimal compensation for land, or using eminent domain to take the land if landowners refuse. For landowners with tax credits for forestry plans on their land, easements could make them ineligible for the tax benefit. Based on present use value laws in North Carolina, landowners may also be required to pay “back taxes” for all the years they received the tax credit. Pipelines or compressor stations close to homes or businesses can threaten public health through exposure to toxic fumes and contaminated drinking water, causing severe headaches, respiratory problems, and worse. Proximity to pipelines significantly lower property values, as we have already seen in eastern North Carolina with the Atlantic Coast Pipeline. In the past month, there have been three fracked gas explosions in the US, some deadly. This pipeline routes through populated areas, and near homes and schools, including through the campus of Alamance Community College. With a pipeline of this diameter and pressure, the Evacuation Zone Radius is 2,051 feet. Data show that pipelines built since 2010 are failing at a rate similar to the failure rate for pipelines constructed pre-1940. An independent firm, Synapse, has done a full report to document the lack of need for additional pipelines in the state . They have found that the current capacity for fracked gas exceeds the projected demand for the next 10 years. Why would a company invest billions of dollars in a pipeline that no one needs? Because the companies could be guaranteed up to 14 percent rate of return by the Federal Energy Regulatory Commission. North Carolina currently ranks second in the nation for solar energy production, and more than 34,000 people have clean energy jobs in our state. With the current infrastructure and the growing trend towards renewable energy sources, North Carolina should not allow another fossil fuel pipeline. This pipeline puts the communities in the Haw watershed at risk, and would only benefit out of state corporations while abusing our community members and natural resources. Haw River Assembly, along with several other community groups, are organizing community members and landowners to stand in opposition and encourage local and state officials to oppose this pipeline. Visit noMVPSouthgate.org  to learn more and join us in opposing this pipeline. Emily Sutton is the Haw Riverkeeper with the Haw River Assembly .